In an industry where technology is constantly changing at a rapid rate, it becomes more challenging to stay in tune with the latest technology. As industry leaders, it is vital that we share our ideas and perspective with peers and colleagues. WHY SHOULD YOU PRESENT AT THE TECHNOLOGY CONVERGENCE CONFERENCE? 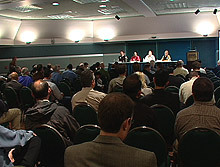 An important purpose of the Technology Convergence Conference is to provide high-quality educational sessions for IT Professionals, Facilities Professionals, Data Center Professionals, Chief Information and Technology Officers, Building Operators and anyone involved with the design, planning and project management of a buildings’ facilities infrastructure. Senior Manager Real Estate and Facilities SYBASE, Inc.
banner displays. The web site averages over 3,000 per event. Interact with over 600 IT and Facilities professionals who will apply your insights to meet their daily technology and facilities challenges.